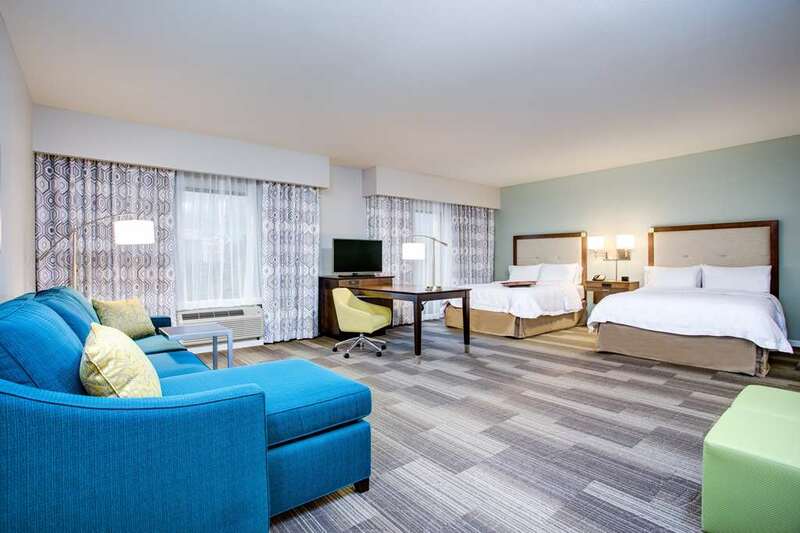 Unwind in a comfortable and modern guest room or suite at Hampton Inn - Suites Macon I-475. Feel at home with modern amenities including free WiFi an oversized desk with ergonomic chair a handy lapdesk and a coffeemaker. Watch the free in-room movie channel on the flat-screen LCD TV and get a great night*s sleep in the clean and fresh Hampton bed. Start each day right with Hampton*s free hot breakfast buffet featuring fresh fruit yogurt hearty oatmeal with tasty toppings fresh-baked waffles and more. If you*re in a rush don*t miss the most important meal of the day just grab a free Hampton*s On the Run Breakfast Bag Monday-Friday for a quick healthy meal to go. It*s easy to maintain your exercise routine at this welcoming hotel in Macon GA.Work out with the latest cardio resistance and weights equipment in our contemporary fitness center. Swim in the sparkling outdoor swimming pool or soak up the sunshine on the patio. Print and fax documents in the free 24-hour business center. Take advantage of free WiFi in all public areas of the hotel and recharge with free tea and coffee at any time of the day or night in the attractive lobby. Our helpful staff will be more than happy to offer suggestions about things to do in Macon GA. Friendly service clean rooms comfortable surroundings every time. If you*re not satisfied we don*t expect you to pay. That*s our commitment and your guarantee. That*s 100 Hampton.